SonATA is an acronym for "SETI on the ATA." It is a signal processing software system that controls the operation of the ATA, collects data, and performs signal analysis. SonATA does real-time SETI analysis and it replaces the older, hardware-based Prelude system that was previously used. 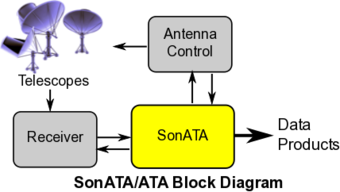 SonATA uses UDP multicast packets as a data bus for moving sampled data into, throughout, and out of the system. 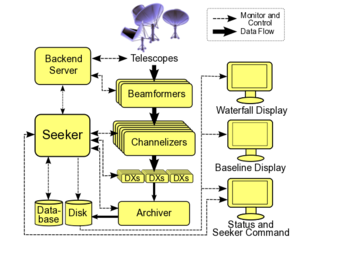 Originally SonATA was developed at the SETI Institute using a closed source development model. The SonATA software was written by a large number of people over the past decade. Then Jill's TED wish created setiQuest which utilized an open model. The open source SonATA code was officially released on March 1st 2011. It uses the GPLv3 license and it is available for download on GitHub. Note: We suspect the GitHub code summary is not quite correct. For example there is no "R" code in SonATA.